More than 600 mammals, birds, and reptiles on 80 acres. Miniature train ride (fee); concessions. Open April-September, daily 10 am-7 pm. Open October-March, Friday-Sunday 1-5 pm. The machine was located near the Zoo Entrance and was working great on August 15, 2008. Worked fine for 2 sets, then started skipping moose design. The Zoo is closed in the Winter Monday to Thursday, from Late September to May. But is open on in the Winter on Fridays, Saturdays, and Sundays from 1 - 5pm. 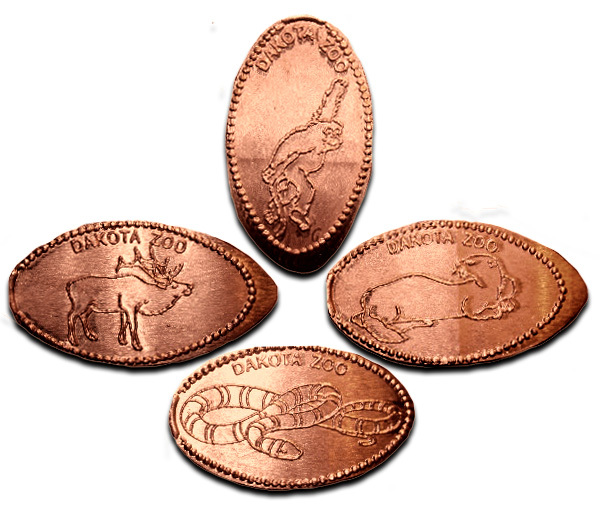 Current designs are: All 4 designs say "Dakota Zoo." thegillion added Dakota Zoo to system.